Helping to dismiss the confusion that holidaymakers in Italy may face when ordering a coffee in the local village bar. "Caffe latte and a wine please"
Coffee is the staple drink for any Italian and every tourist travelling in Italy will be tempted to go into the local bar and try a café. The bars form the hub of any Italian community and workers gather here in the morning on their way to the office, the old men will sit outside most lunchtimes and everyone pops in for a quick café and free snack on the way home. It is essential however, to travel contentedly, that the tourist understands the difference between the Italian menu and the local Starbuck’s if you are to guarantee yourself the invigorating cup you desire. 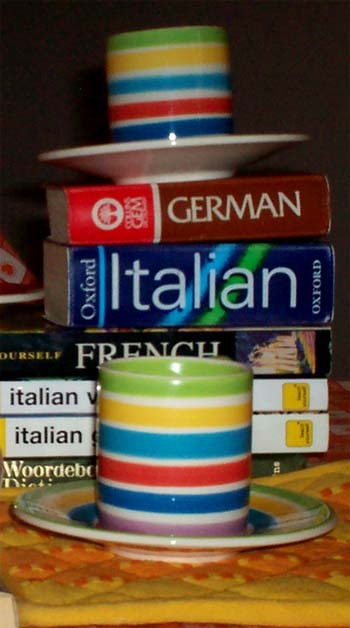 Without much difficulty, language confusions can easily leave you with a small strong coffee or a glass of hot milk instead of the drink you were so desperately looking forward too. So when the waitress asks “Mi dica”, “tell me”, here is your guide to ordering your favourite drink while on holiday in Italy. 1) Espresso or just caffe’ – This is the small, strong, black coffee in a little cup. 2) Caffe’ lungo – Is an ordinary shot of espresso but with added hot water. 3) Cappuccino – A shot of espresso in a cup of hot milk with a foamy top which serves to keep the heat in. They can also be covered in a sprinkling cocoa or cinnamon and served in a large cup. This is normally considered a breakfast drink and not drunk after midday. The name comes from the Franciscan order called the Capuchin, who wore a beige pointed hooded cloak, a “cappuccio”. 4) Caffelatte – Large milky coffee, normally severed in a tall glass, occasionally with the espresso delivered in a separate little jug for you to add. Although it is common within the UK and America to call this drink a Latte, in Italy all this will get you is a glass of hot milk. 5) Caffe Doppio – A double or long espresso shot. Especially for those in need of caffeine hit. 6) Americano – A traditional American or UK coffee, espresso, hot water and milk, that was produced to emulate peculated coffee for the American soldiers in the Second World War. 7) Caffe macchiato – Is a small café shot with a splash of milk in, the macchiato meaning a “stained” coffee. 8) Ristretto – An extremely strong, small black coffee, a half-sized, double strength espresso that really hits the spot. 9) Caffe’ Freddo – A shot of espresso poured over ice to chill, an ideal drink for a hot summer’s day. 10) Caffe’ Corretto – Coffee with a shot of liqueur, normally drink in the bars of an evening. This entry was posted in Top Tips, Travel and tagged caffe, caffe latte, cappuccino, coffee, holiday, Italian, Italy, language, vacation. Bookmark the permalink.